Winter has definitely made its presence felt here in the UK this past day or two and how! For days the media was full of dire warnings of incoming rain and snow and of course everyone carried on with their lives because what else can you do. We've had snow twice so far this winter but they were nothing compared to this latest bitterly cold, wintry blast. The media quickly named the approaching weather front "the beast from the east" coming as if has from the direction of the frozen plains of Siberia. It was mentioned a few times in the break room at work, and even on the TV that's always switched on in there, but everyone smiled and no one took it too seriously. I just assumed that was it. The media had been doing their usual hysterical over stating of the allegedly worsening weather to weird everyone out and it was fine. It was no worse than the last snowfall we had a few weeks back and it was fine. I snapped a couple of photos of the garden, the photo above and the one below were among them. I love how the flash seems to have caught lots of the snowflakes, and our beautiful furbaby Jades eyes, in this image. It's almost magical. Yep, it snowed, then it snowed and then it snowed some more! It got pretty scary outside. Hubby came home from work early yesterday afternoon because they decided to close the office and let everyone go home before the weather got any worse. So mid evening last night I snapped some more photos and thought ok, now this must be it. There can't be anymore snow now can there? Aw look at those two large planters buried under all that snow honeys! The one nearest the camera, with the bamboo supports just peeping out of the snow, is our lavender which we planted almost exactly two years ago. The other large planter is home to our beloved peony roses which had only just begun to appear through the earth before this weather hit. I'm so happy that I covered them with a small hand towel to protect them from frost the day before the snow arrived. It should protect them I hope. The lavender too has a small hand towel covering the earth around the base of the lavender itself. I used small cotton hand towels because the fabric will keep the plants "warm" and keep the frost out but being cotton they would allow moisture through too. 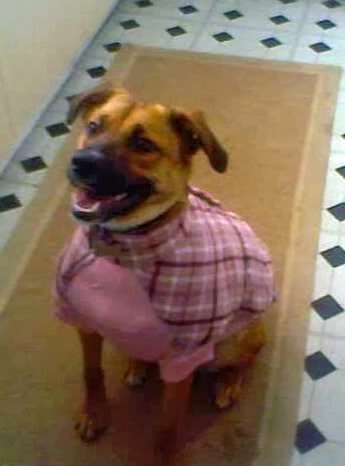 So, with all of this additional snow, our furbaby Jade, who does love her back garden, needed a jacket before being allowed out so that she doesn't get a chill. Yes, dogs have a fur coat but our baby has always worn a jacket for walks and I wasn't about to allow her to be cold wandering around in all that cold, frosty snow. As it turns out, it was good that she did have a jacket on because the snow came up as high as her tummy/sides bless her. In the photo above she has snow all across her face and nose and doesn't look terribly happy about it. Enough of the back garden for now then honeys, let's have a look at our little front garden shall we? The steps leading up to our front door have disappeared completely! The top step you can see at the door in the photo above isn't actually a step it's a built up line of snow which has been driven against the front door by the wind. Looking beyond the front steps (or where they should be!) down the garden path and out across our little cul de sac the view is almost magical. The garden is a sheet of snow with only the top of the planter, one of two which sit either side of the front door, visible, sticking up out of the thick snow. Looking to the right hand side of the front door honeys it's enough to break my heart. These stunningly beautiful, precious, miniature roses were a Christmas gift from a dear friend and lived on the kitchen window ledge through last winter until they were finally re-homed outside in this planter last June. As well as our other beautiful roses too of course. I desperately want to be out in our garden, not looking out at it through windows all covered in snow. It's at times like these I'm so glad I kept a record of a "year in the life" of our garden, via the Picture Perfect Project. It's wonderful to be able to look back at everything that happened that year. If you haven't seen it honeys you can find it here. Winter this year has gone on far, far too long. Really, it's felt like forever and a day and I'm so fed up of long, dark days and cold, biting winds. I need blues skies, sunshine and perfect fluffy clouds and most of all I need to feel warm instead of the cold and damp that seeps into my arthritic bones and joints and makes them ache terribly. This weather is trying to turn me into a human pretzel and I'm so fed up with it now. How are you coping with winter honeys? Have you seen a lot of snow? Are you in the UK? If so, please do be careful, this "beast from the east" isn't done with us yet and neither is Storm Emma I'm afraid.